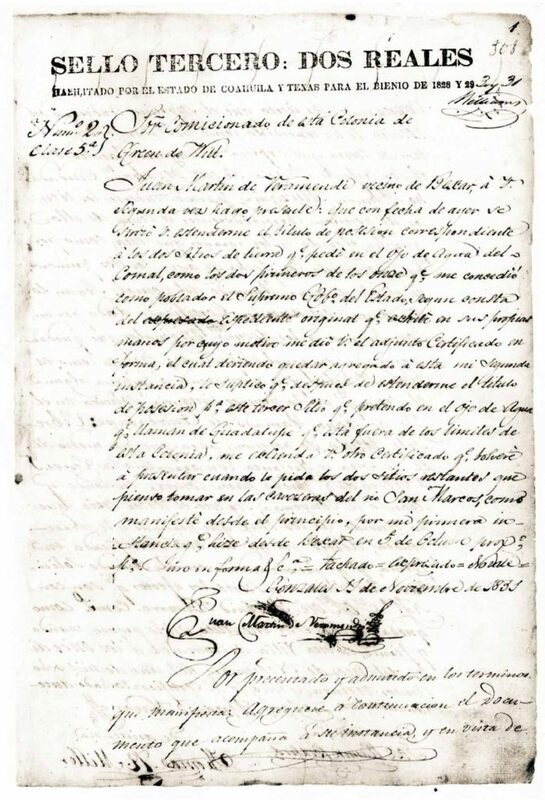 Son of Fernando Veramendi and Maria Josepha Granados, Juan Martin de Veramendi was born on December 17th, 1778 in San Fernando de Béxar, now current-day San Antonio. He was one of 5 children, and grew up under the watchful eye of his businessman and politician father. He would marry Josepha Navarro and parent seven children, several of which would influence Texas and Veramendi History. His daughter Ursala Maria de Veramendi married Texas legend James Bowie, from which Bowie and Veramendi formed a business venture establishing cotton mills. Bowie’s expeditions into Indian country were even financed by the Veramendis. Like his father, J.M. Veramendi also pursued his political interests. He served as Bexar County’s collector of foreign revenue at the age of 44 and was elected the first “alcalde” of Bexar 2 years later in 1825. Similar to a mayor, an alcalde is considered the most important official in a Spanish town having responsibilities as chief executive, judge, and head of town council. In 1830 he was elected vice governor of Coahuila, a Mexican state along the U.S. boarder, and assumed the office of governor in 1832. This would be the highest office he held prior to his death just one year later at the age of 54. Just 5 years before his death he would leverage his political connections to petition for a Spanish Land Grant of 11 Leagues (a league was 4,428.4 acres), and in 1827 his request would be granted. The land grant he received included the land which now plays home to the Veramendi Master Planned Community. Upon his death, Maria Antonia Veramendi, would be heir to his estate where together with her husband, she would continue to divide and sell the remaining family land. The 2,426-acre ranch and home of Veramendi would eventually find its way to Joseph Landa. The Landa family, the namesake of New Braunfels’ Landa Park, used the property to ranch cattle. The location of the ranch was ideal. It allowed the cattle to graze freely just outside of the young Town of New Braunfels, and once the cattle were ready for market they could be herded down the hill to the railroad line for shipment. Known as “Landa’s Pasture”, the holding pen for the cattle was located on the corner of present-day Landa Street and Fredericksburg Road. In 1896 Joseph Landa’s son, Harry, took over the family business. He operated the ranch and mills for 30 years before his mother’s passing, after which her will stipulated that the Landa estate be liquidated ten years after her death. This stipulation led to the meeting of Dean Word Sr. and William Hovestadt. William was involved with the real estate dealings of the Landa Estate and Tim ran a construction company that used mules to build roads. Dean Word Sr. would purchase the Landa Ranch on December 5th, 1941, and just over 24 hours later the United States would enter World War II after the Japanese attacked Pearl Harbor. The Words would remain steadfast through the war, and in 1956 extended their family to include the Borchers as Bill Borchers married Joyce Word. The ranch would remain under the Word-Borchers’ ownership for the next 50 years where they would eventually partner with ASA Properties to envision a new standard of living in New Braunfels. Through their combined efforts, the vision for Veramendi grew into the master planned concept seen today. We are pleased to pursue the next chapter in the property’s history, and are confident that we can take actions now to leave a legacy of quality, sustainability and excellence for all future residents, businesses, students, employees and visitors.